Renewal isn't something new in 2011. In fact, the details were announced by Gravity as early as 2009. Gravity used most of their time in 2010 to release the proposed changes, with more balancing patches yet to come. 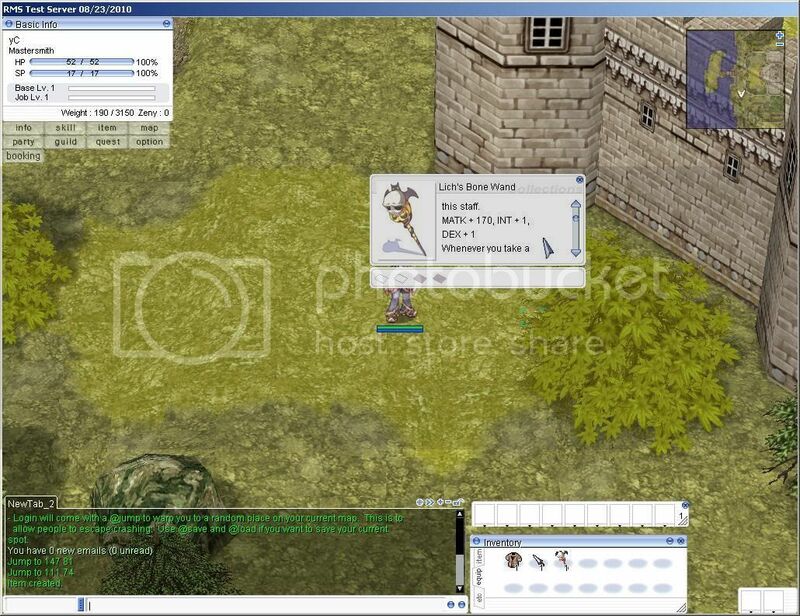 On RMS, while we keep you up-to-date on the pre-renewal Ragnarok, we've been constantly looking into opportunities to create a reliable database for the renewed Ragnarok Online. Fortune for us, the developers and contributors from the eAthena community made this possible. Today we are delighted to announce that we're slowly moving towards support for the renewed Ragnarok Online. We will create versions of our pages in renewal version in addition to the current pre-renewal version. We also expect that the Renewal servers are going to be the norm eventually, but until then the pre-renewal pages will stay the main focus on our menus and the search bar on the top. During this transition stage, we will provide update to both pre-renewal and renewal Ragnarok. So far we have the first phase of items, monsters and third job skilldatabases completed based on renewal data from the Renewal-Project SVN. To make things as convenient as possible, RMS will include a link between pre-renewal and renewal in both versions of the item and monster databases within each item or monster block. Right now we are looking into the possibility of modifying other parts of our site, such as the Skill Simulator and the majority of the tables under the Misc Database, to include renewal information. If you have any suggestions, or you would like to tell us what you think about the situation, just leave us a message at the forum in reply to this news topic. Note: You might need to refresh your browser if you notice any viewing or loading problem. Pretty neat that you guys are moving on to that. Personally I can't stand renewal one bit and I believe it killed the game, but good luck to you all! As long as the pre-renewal database doesn't go anywhere - ever - then I'm happy. pServers will adhere to renewal-haters, too, so the database remains important, even after its time. Yea I do like you are working on both now. But I hope you will keep both dbs in the future too! Renewal is still too unstable to rely on. I believe jRO is considering completely renovating renewal to create balance. This is still too premature, -1 on my part. Yea Epoque, we are not relying on it atm. The existing pre-renewal stays the main focus. The renewal info is additional because certain server/player would like to see it. I remember it was +20% MATK..., maybe its just lich bone wand. did you find anything else? I'm playing a server updated until Niddhogur and it's showing me % (which makes a hellah lot more sense), pre-Renewal. Never seen these weird +### anywhere. Basically this happens because there is only one translation svn available (that is being worked on) and currently both renewal and pre-renewal servers are using different revisions of that source not knowing it is the "latest kRO item translation" which implies "renewal". Because as we all know in the "real" kRO/iRO world there is only one RO version now (that is renewal, there is no pre-renewal in official iRO/kRO), it doesn't make sense for the translation project to keep track of what is in renewal and what is not. Everything is changing as time advance, even pre-renewal item effects could change. So there is no one magic file that has all the pre-renewal item descriptions. Gravity are makiing the changes gradually. The translated description we get are whatever that are latest being translated from the kRO client files. While most items have the same description as pre-renewal, things like these are going to happen. While reading this http://ro.doddlercon.com/wiki/index.php?title=Renewal_Changes#Magic_Attack_Equipment I notice many items involving matk are updated in renewal. So i'll start by checking and editing many of the items that involves matk to get the % back for pre-renewal. A fix is on its way, once I catch them all i'll upload it. If you see anything else that need a pre-renewal fix (not matk related), just report it here. Thanks Yusifer. "Updated" bunch of items giving back the matk %. You forgot some bg weapons like Brave Gladiator Blade. Okay, done. Let me know if there are others. Also related to renewal, now you can change the top quick search bar to search between the renewal or non-renewal item and mob databases. The option is within the "Rate Settings" page, it's on the side menu or in the item or mob pages. I'm for keeping the original database along side the renewal one since the pserver I'm on is always going to use pre-renewal mechanics. If all is moving on then why is it that when logging onto Rate My Server to check for monster exp we do not get renewal fact we are still getting prerenewal? Is the another link to get renewal facts or not?